Historical buildings, beautiful landscapes and the original Pastel de Belém. 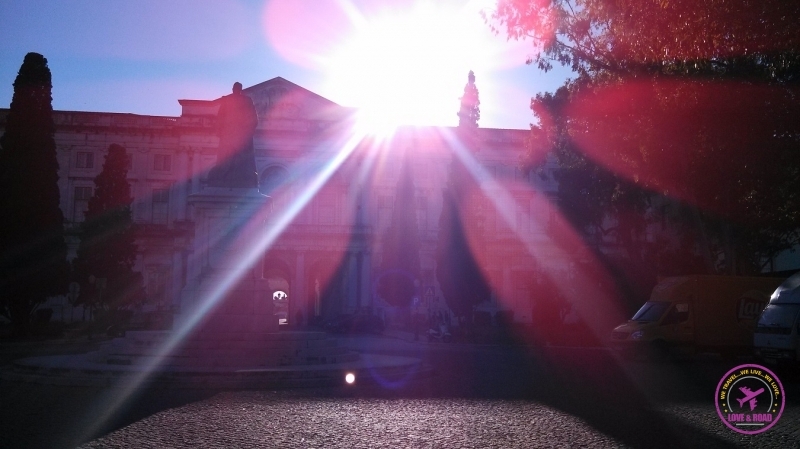 One afternoon in one of the most beautiful neighborhoods in Lisbon. To help you enjoy the area here is a useful guide: 5 Things to do in Belém! The day we choose to visit Belém wasn’t the best one. We woke up around 10 am. After only four hours of sleep my head and stomach weren’t fine. The problem wasn’t the lack of sleep, the problem was the night before and the drinks we had in the club. Rob was ok, but I was wrecked. Now I already learned that partying and sightseeing most of the time don´t work together. Said that, let’s go back to Lisbon time. We had a mission that day: Discover the best things to do in Belém! We had breakfast and went for a walk in Feira da Ladra (flea market), then we took a bus to Belém, a very nice neighborhood that is located alongside Tagus River. As long as we walked around, I was getting better and happier. That area is so beautiful and the weather was so amazing that I had to fight against my hangover and enjoy the day! In a few minutes and we were in our destination and ready to enjoy the best attractions and things to do in Belém. First stop was at the “Padrão do Descobrimento”. The monument is on the shore of the Tagus river and celebrates the discoveries the Portuguese Navy did through history. Enjoy the nice view and keep walking. You will pass by the museum of popular art and the CCB (Cultural Centre of Belém). If you want to see some arts and historical pieces you can stop by, or just keep following the promenade till you arrive at the stunning Belém Tower. The tower was built in 1515 to guard the entrance to Lisbon´s harbor, and from there many of the discovery boats departed. You can get inside the tower, but the best view is actually from the left side of the monument. Pass by it, go through a little park, you will see the signs for the toilet, and at that point walk to the river. There you will see the whole tower, without tourists in front of it. Perfect for a clear shot. Now it is time to leave the river and visit one of the most emblematic building in Lisbon. The Jeronimo’s Monastery was built in 1502 in honor to the navy. Back in time, there was the place to pray for the sailors and where the most important ones were buried. Apart from the history, this place is amazing. The architecture is beautiful, on the walls and on the columns there are sea symbols that tell the history of the Age of Discoveries. After all this walking and visiting such nice places my hangover was gone and it was time for a snack and some rest. Belém is worldwide known not just because of the monuments. This neighborhood is really famous because of a delicious mouth watering custard cake. That’s the truth! Most of the people that visits Belém just go there for the traditional “Pastel de Belém”. Try this delicacy is one of the best things to do in Belém. You can buy this cake all around Lisbon, but they don’t taste the same as the original made here since 1837. Yes, more than 180 years baking the same cake, and no one in town knows the recipe. It`s very easy to find the shop called Pastéis de Belém, it is always the shop with the biggest queue in front. Prepare to wait around 10 minutes, but is totally worth. When you think nothing can get better, the attendant comes to you with a fresh baked and still hot pastel. You can fight for a table and eat in or run to the next square, sit in a bench and enjoy this piece of heaven while listening to the water fountain. To finish the day and walk a little bit more, we decided to go to Palácio da Ajuda. Around “Pastéis de Belém” you will find the signs that will tell you to go up the hill. Prepare yourself for a good walk. We went there on a Saturday afternoon and the place was empty. We could walk around, take pictures and no one to bother us. The palace is really nice and besides it there is a botanic garden to visit. Our day finished with a beautiful sunset over the palace. A beautiful view, a nice weather and a taste of that delicious looking pastry with a century old recipe are great hangover remedies. Who wouldn’t feel better with those? Nice post, enjoyed reading it. And you are totally right, an afternoon at Belém neighborhood is the best cure for any massive hangover!